Mechanical Mayhem had a wonderful experience at the Pine Tree District Event on March 30-April 1! We enjoyed playing the game with many Maine teams as well as teams from around New England. After ranking first for much of the competition, a couple match losses landed us as the sixth seed by the end of qualification matches. During alliance selection for the elimination round on Saturday, we were chosen by the first seed, Team 2648 Infinite Loop, who also picked Team 4906 The Collective to round out our alliance. This alliance went undefeated in the elimination round and won the competition! 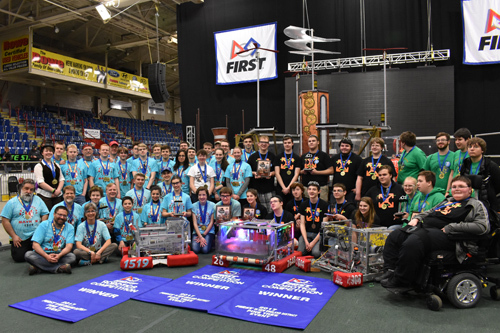 In addition, our team won the top judged award, the Chairman’s Award, and will go on to be one of the ten Chairman’s Award winning teams from New England competing for one of the four Chairman’s Awards given at the New England District Championship this weekend. Also, one of our students, Faith, was one of two students from the Pine Tree District chosen to compete for the Dean’s List Award at the New England District Championship at which six of the 20 students chosen at district events will be named Dean’s List Finalists. If you have time, please check out our Chairman’s Award video created by students as part of the Chairman’s Award submission, as well as a highlights video of the team at the Pine Tree District created by Mechanical Mayhem alumnus David Jennings. The team is now in the midst of the New England District Championship at the University of New Hampshire in Durham, NH. Going into the last day of competition, Mechanical Mayhem is ranked 10 of 64 of the top FIRST Robotics teams in New England! With two more qualification matches this morning, Mayhem hopes to play in the elimination round this afternoon.